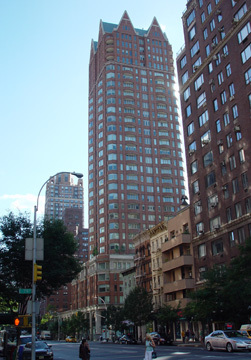 With its very tall gables, this 32-story condominium apartment tower would seem more at home near the peaks of the Dakota apartment building on Central Park West at 72nd Street than in the middle of a fairly bland stretch along Third Avenue in the 70s. It replaced a two-story building that ran between 77th and 78th Streets along the avenue and hid a spacious private garden enclave that had been known as "The Cottages" that was designed by E. H. Faile in 1937. "The Goelets, a New York merchant family dating back to the Federal era, had such a problem with a row of eight 70-year-old tenements on the west side of Third Avenue between 77th and 78th Streets In 1936, new multiple-dwelling regulations required substantial upgrading, and according to the Real Estate Record and Guide in 1938, the cost was not worth the result. The Goelets evicted their tenants and reimproved the property with a novel scheme, using a lot running almost 150 feet deep. 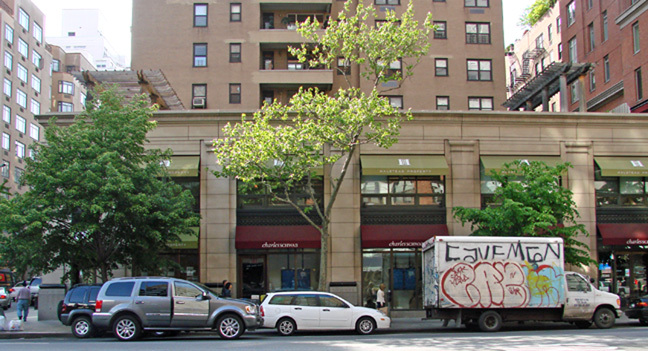 They built a two-story apartment/store building with a tennis/badminton complex behind Access to the apartments above the stores was not from Third Avenue, with its noisy, blighting el, but from 78th Street, where a walk leads to stairs to the eight apartments. The cottages are of ingenious design, with glass-block windows on Third Avenue to seal out the rattle of the el, which was not demolished until 1956. Their front doors are at the second-floor level, where a setback creates a strip of tiny, 20-foot-deep, turfed front yards. Designed by Edward H. Failel, an engineer who also designed the Goelet Building at 49th Street and Fifth Avenue, the cottage complex really has two fronts. The stores on Third Avenue are of plain brick with simple show windows, albeit with very soft purple art-lgass transos and big circular marquees at the cross-street corners. The garden side is basically Regency in theme, with white painted brick (now weathered bare), Chippendale-style ironwork and brick quoining. The apartments are all one-bedroom units, although the corner ones have tiny square sunrooms. There is a protected feeling here, not as grand as the gardens of Sutton Place but just as serene and removed. This delightful amenity is not hidden from the passers-by behind brick walls - the usual model in New York - but only lightly screened by an iron fence. It is a gracious touch in a city where public and private rarely mix." Mr. Gray noted that the Goelets eventually sold off a 100-foot-square plot on 77th Street to Sidney and Arthur Diamond who in 1941 built the 11-sotry apartment house at 177 East 77th Street and eventually bought the entire Cottages site. In 1961, the Diamonds filed plans for a 20-story building to cover the Cottages site and did not carry it out, Mr. Gray added. 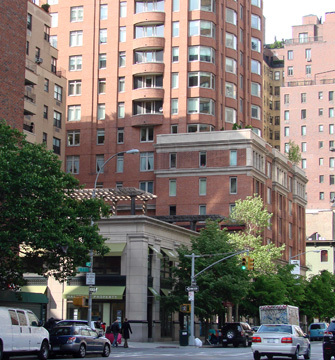 The Cottages, which contained stores on the first floor and eight one-bedroom apartments on the second floor with glass-block windows facing the avenue, were undistinguished architecturally, but the charm of the garden and the anachronism of such underdevelopment in such a prime area of the Upper East Side led to one of the city's more heated landmark controversies in the 1990s. "In contrast to the Modernism of the glass and brick Third Avenue-facing facade, the garden front, with its flights of stairs leading to the raised terrace, had overtones of the late Georgian and Regency styles," the authors wrote. A local coalition rallied to have the enclave declared a landmark but eventually the site was not so designated and five of the eight residents accepted a settlement to move and the building was topped out in the summer of 1999. The design for the site incorporates part of the Cottages at the northwest corner at 77th Street, but the main portion of the development is on the northern end of the site, which give the apartments considerable "light and air." The tower has a very handsome, six-story base on its north end of rose-colored brick and pre-cast stone that simulates limestone, the same material as used on the tower. The base is very attractive with large, arched windows on the second floor and a two-story pre-cast stone lower section at the south with pilasters and a top floor with pre-cast stone window reveals. The tower has chamfered corners with bay windows and curved brick spandrels and some curved balconies. The corner bay windows detract somewhat from the otherwise excellent sense of pre-war solidity, but they are also very desirable for their dramatic views. Hartman-Cox Architects of Washington is the architectural firm and Schuman Lichtenstein Clamon Efron are the designers of the apartments, which have 9-foot-high ceilings and washers and dryers. The building has a new private garden designed by Thomas Balsey Associates and some landscaped rooftop and terrace areas in the base including a pergola. The developer of the building, which has 77 apartments, is RFR/Davis, a venture of Davis & Partners and RFR Holdings, developers previously of rental projects. Most of the apartments have two or more bedrooms, foyers, formal dining rooms and marble baths and there are 36 storage rooms and 36 wine cellars available for purchase in the building. Some apartments have fireplaces. The building has a 25-car garage. 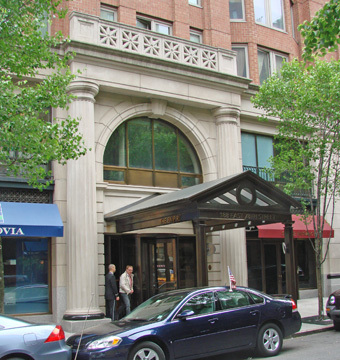 It also features the Empire Club, designed by Birch Coffey Design Associates and accessed by a grand staircase from the building's marble lobby. The club has a fitness center, a children's playhouse, a cinema room and a private dining room with adjoining terrace and a sundeck on the third floor. 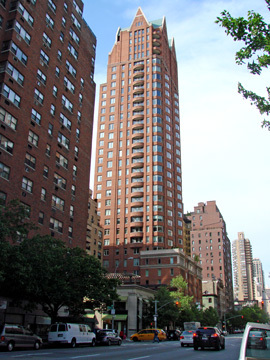 While Manhattan is sorely needs as many tennis and badminton courts as possible, the loss of The Cottages was not the end of the world for the Upper East Side and the new, setback tower's Post-Modern modeling is generally cheery and warm. There is excellent cross-town bus service one block to the north and a local subway station is at 77th Street and Lexington Avenue, where Lenox Hill Hospital is located. This neighborhood has many pleasant restaurants, although there are no nearby parks.